Two of our primary goals in building a world-class enterprise technology company are to create an enviable company culture and to ensure the success of our customers worldwide, which includes the safety of patients and consumers. These two strategic hires will help take Controlant to the next level. Controlant, a leading provider of cold chain monitoring solutions for the food and pharmaceutical supply chains, today announced that Vally Helgadottir and Stefan Karlsson have joined its executive team as Chief Services Officer (CSO) and VP People and Culture, respectively. In her new role as CSO, Helgadottir will be responsible for managing Controlant’s customer success and service program and its unique, high-velocity services model, including for 24/7 shipment monitoring and response and reverse logistics. As VP People and Culture, Karlsson will be responsible for the recruitment, growth and development of Controlant’s most important asset — its people — across its global presence. Karlsson, who is a co-founder of Controlant and was previously COO, will be responsible for the growth and protection of Controlant’s unique corporate culture. Both Helgadottir and Karlsson will report directly to co-founder and CEO, Gisli Herjolfsson. Helgadottir is a seasoned customer success executive with more than 15 years of international pharmaceutical experience. Prior to Controlant, she was Department Manager, Customer Service, for Distica, Iceland’s largest pharmaceutical distributor. Previously, Helgadottir was Customer Service Manager for Medis, where she managed service and support for large international customers. In the U.S., she served on the agency side for three separate pharmaceutical agencies under the Publicis Group umbrella. Helgadottir holds a Master’s degree in Project Management from Reykjavik University, a Diploma in Quality Management from the University of Iceland, and a Bachelor’s degree in Organizational Communication, Learning and Design from Ithaca College. Karlsson is a seasoned executive with more than 10 years of experience in the leadership field. He was previously a member of Controlant’s Board of Directors after serving in the COO role, where he led the company’s day-to-day operations, including executing the company’s business strategy and introducing new products to new markets. Prior to Controlant, Karlsson was Vice Chairman and CEO of Knattspyrnufelagid Valur, one of the most prestigious sports clubs in Iceland. Karlsson also participated in building up Vinnuföt, an Icelandic B2B service company distributing speciality workwear and personal protective equipment. Karlsson holds a Master’s in Business Administration from Reykjavik University and a Bachelor’s degree in Business Administration from Bifrost University in Iceland. 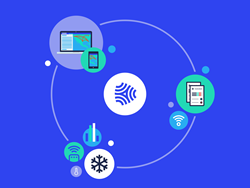 Controlant offers a powerful trifecta of cold chain monitoring solutions, delivered as a service: an innovative combination of a location-aware intelligence cloud platform powered by wireless and reusable Internet of Things (IoT) data loggers, and a variety of managed services, including reverse logistics and 24/7 monitoring and response, driving growth and profitability for businesses. Controlant’s solutions empower those responsible for cold chain performance to stay abreast of critical metrics and situations in real-time when their shipments or assets are in-transit, addressing problems quickly when they arise to proactively prevent damage or waste. Real-time analytics provide customers with insights to fuel future decision-making and collaboration throughout their business ecosystem. More than 200 customers in 100 countries, including top food, pharma, and logistics companies such as Chipotle, Alliance, and DHL trust Controlant to optimize their cold chain performance. Learn more at controlant.com.